A flowchart is a diagram that represents the sequence of steps to solve a given problem. It is easier to learn and write than a regular programming language. Moreover, it helps to identify the required steps to accomplish a particular task. There are various symbols in a flowchart. An oval symbol represents the start and the end of the flowchart. Meanwhile, a rhombus symbol represents inputs and outputs operations. A user entering the values for variables is an input operation. Displaying the calculated result on the screen is an output operation. A rectangle represents a process such as a calculation or a variable initialization while an arrow describes the flow of the sequence. Moreover, a diamond symbol helps to perform decision making. Furthermore, a system flowchart reflects the relationships between inputs, outputs and processes. 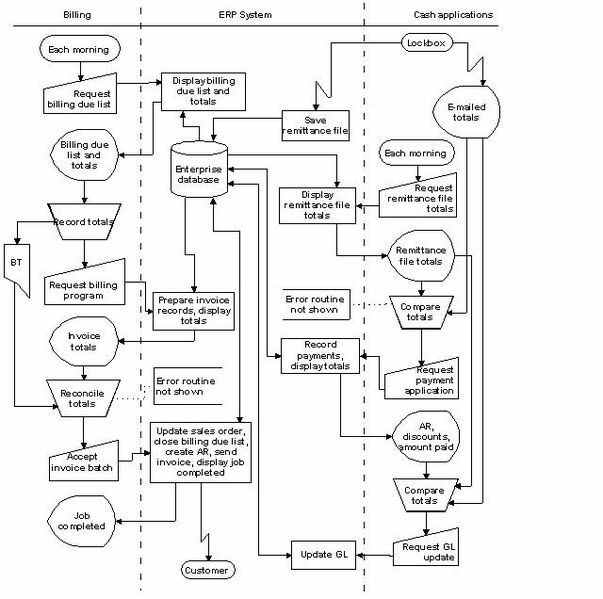 Managers, business analysts, and Software Engineers use system flowchart to analyze and design the system. An entire software system is a collection of multiple programs. A program flowchart describes a single program. Before writing the program, it is a good practice to draw a flowchart and identify how to solve the task using that program. For example, assume that you need to create a program to find the area of a rectangle. The first step is to declare a variable called area and to initialize it with zero. Then, you can enter values for length and width. The third step is to calculate the area and to store the result to the variable area. Finally, the calculated result is displayed on the screen. 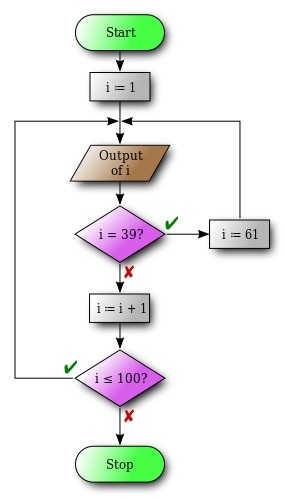 After drawing the flowchart, the programmer can write the program by following the steps in the program flowchart. This is an effective method, especially when solving a complex task. System flowchart is a type of flowchart that explains the functionality of an entire system. In contrast, a program flowchart is a type of flowchart that explains how a particular program solves a given task. Thus, this is the basic difference between system flowchart and program flowchart. Complexity is a major difference between system flowchart and program flowchart. System flowcharts are complex and are difficult to understand. 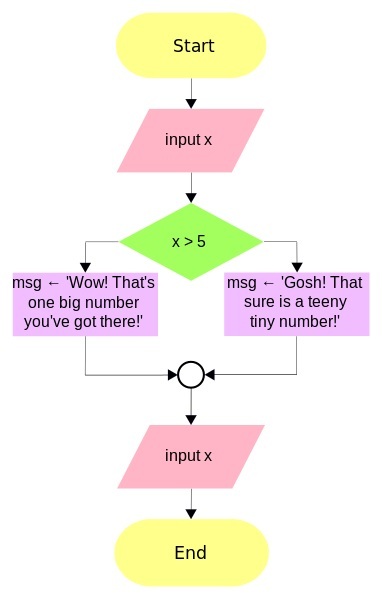 However, program flowcharts easy to understand. There is another difference between system flowchart and program flowchart based on their usage. A system flowchart helps to get an understanding of the entire system while a pogram flowchart helps to get an understanding on how to solve the problem using the program. In brief, system flowchart and program flowchart are two types of graphical diagrams. 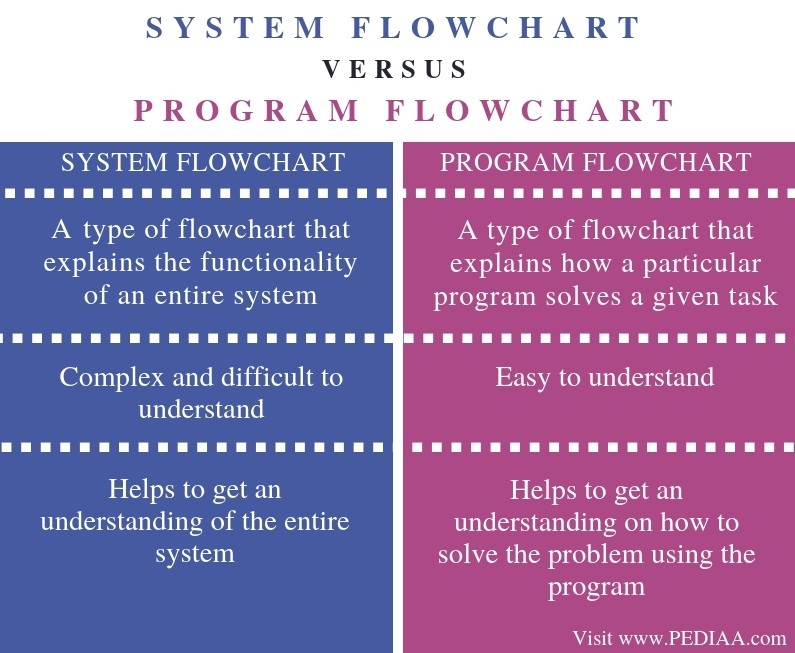 The main difference between system flowchart and program flowchart is that a system flowchart represents an entire system while a program flowchart represents a single program. 1. “Flowchart.” Wikipedia, Wikimedia Foundation, 18 Oct. 2018, Available here.